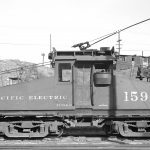 Pacific Electric 1218 Southbound along Pacific Coast Highway near Huntington Beach, August 24, 1946. What is the point of the Dash Sign facing rearward…for the people running to catch the cars from behind before they depart a stop? I remember seeing “Butterfly Twelves” on the rush-hour three-car trains to Monrovia. 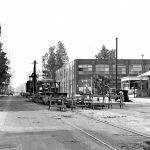 All of the other cars on the Monrovia-Glendora line were 1100s, but we’d get one train of Twelves, of any sub-class except Long Beach trailers, for morning and evening peaks. I have a vague recollection of noticing that the Butterfly Twelves would often have a trolley wheel (like a box motor) rather than the more common shoe. 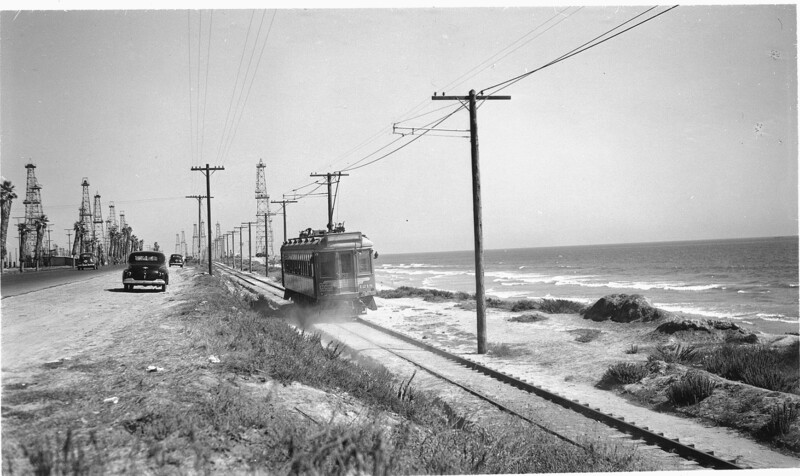 Years later I would learn that cars running on the Balboa line had to use wheels because the grease used on other PE passenger lines would not stay on the wire along the seashore.